Congratulations, you have just been Dawn Summers for five minutes. Me: Vancouver won the Western conference. Her: No, the Mavs beat Oklahoma last night. I’ve discovered that my super power is deciding to do things that’ll make me feel awful, doing them and then feeling awful! Ftrain: I thought you hated that guy, why are you following him now? Me: Oh, he made me laugh on twitter. We’re cool now. Congratulations to the newlyweds Kaz and Tito! You know that thing where you care about something and your heart goes out to people even though you, your family, the Patriots or the Mets are not harmed in any way? What’s that thing called? I totally want to do it. At first, he couldn’t wave at all. He’s just your regular average Chinese baby. Then, after five minutes under the tutelage of yours truly AND exposure to my three step champion waving system, presto chango: Awesome waving Chinese baby! And anybody who says this took all weekend is a liar! Five minutes! The other day and a half was spent teaching him to reject Lady Gaga and embrace Madonna! I don’t know why F-train kept trying to get me not to go to your party. Why is such a tiny man filled with so much hate? Looking forward to attending the event of the decade in a couple of weeks! I get mixed up with Lady Gaga! New post up at The Emporium. Thank you so much for the fancy new can opener. 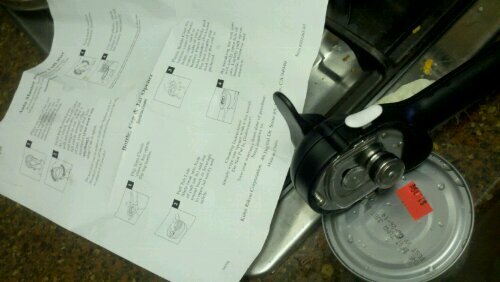 However, after multiple readings of the directions AND matching of illustrations, my tuna remains unopened. You are currently browsing the Clareified weblog archives for May, 2011.